Bauer College Finance Association member Oscar Vaquerano (left) visits with a student team to assess their plan for Houston’s energy needs in 2050. For students in the C. T. Bauer College of Business at the University of Houston, understanding the business of the energy industry is essential, and now, they’re teaching what they’ve learned to a younger generation of Houstonians. 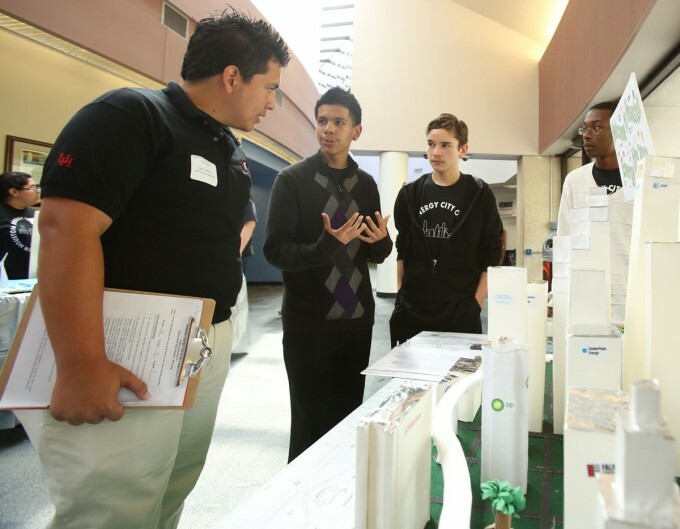 In mid-May, the Finance Association, a Bauer student organization, hosted and sponsored 27 teams of middle and high school students for the Energy City of the Future 2050 competition, presented by the Harris County Department of Education’s Cooperative for After-School Enrichment (CASE). Competitors were asked to build scale models of Houston for the year 2050, demonstrating energy development, usage and delivery. They were also charged with developing a marketing campaign to explain how the energy industry plays a vital role in Houston’s future. Judges used criteria including economic profitability, cost efficiency, and energy efficiency and environmental quality to determine top energy cities. Each model city had to incorporate three types of energy, such as wind, petroleum, nuclear or solar power. Other event sponsors included GDF Suez, Consumer Energy Alliance, Sequent Energy Management, Education Foundation of Harris County, the Cooperative for After-School Enrichment and Harris County Department of Education.